One could describe this plant as so: curious, stinky and singular. Curious because in each of the stages of growth we could think in presence of different species, the singular flower which appears very early in spring, is to be quickly replace by immense leaves and it is that once these leaves disappeared that we can observe his fruit which looks like a potato or a dark pineapple, then finally come the seeds that once released from the fruit seems bound with nothing..
Stinky, the plant emit a strong smell of overcooked cabbages, skunk and burned rubber, we can also discover stenches of garlics, spices, truffles, and even coconut ! Singular because the plant grows backward, indeed year after year the plant sinks into the ground rather than to grow in height. 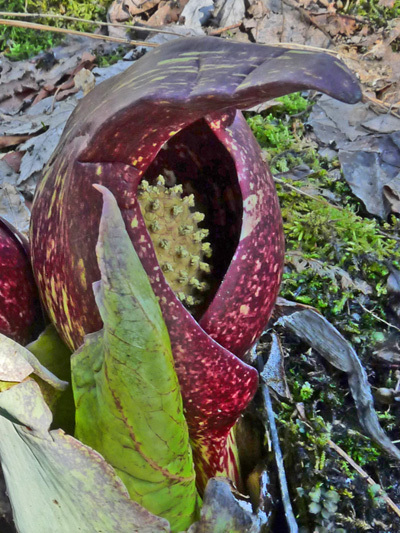 Finally the Eastern skunk cabbage is thermogenic, it's one of rare plant to produce heat, up to 35 °C above the ambient temperature, that's why it's our first plant to bloom, sometimes even in winter!